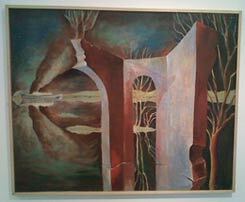 The exhibition of Irish Surrealist Art at the FE McWilliam Gallery in Banbridge had a variety of interesting pictures. I want to mention two. Ralph Cusack (1912-1965) is an artist whose work one will wait a long time before glimpsing. It very rarely comes through the saleroom. He is a curiosity rather than a substantive artist,perhaps. Readers may know something about him if they have read that wonderful book by Anthony Cronin,”Dead as Doornails”. Anyone interested in the cultural life of 20th C Ireland would enjoy that book and it has a story about Mr Cusack which will encourage curiosity. 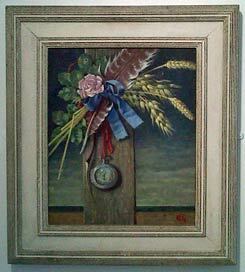 The other artist whose work is shown here, Beatrice, Lady Glenavy,(1881-1970), is more like the real thing. She attended the Dublin School of Art and was taught by Orpen. Her work is fascinating and original. It does come through the salerooms from time to time and is worth keeping an eye out for. (One of her claims to fame was that she was the mother of Patrick Campbell, who later became 3rd Baron Glenavy, and who was popular for years on Call My Bluff on TV.) There was another, sensational picture by her at the show currently on at the Ava Gallery at Clandeboye, seat of the Marquess of Dufferin and Ava and now home to his widow. This one was a picture of an owl and in some ways stole the show amongst so many great artists. The gallery is well worth a visit. I was even able to buy a copy of Dickon Hall’s book on Colin Middleton, which is not easy to come by in England. Mention of Middleton reminds me of a surprise sighting of a rather lovely picture by him on the upstairs landing in another grand Irish house, Florence Court in County Fermanagh. Seat of the Earls of Enniskillen, but in the hands of the National Trust since the 1950’s, it was completely out of context in a house which contained nothing else of that type. A note on the picture explained that it had arrived at the house during the period of the NT’s ownership, which explains its presence there. As I was looking at it the man next to me said that it was by van Gogh, which would have been an even more unlikely find.